The Raleigh Strada 6 was, until recently, the most expensive hybrid bike in the stable of the legendary British brand. We originally tested it as an option for cycle touring – more of which later – but first let’s see how it stacks up as a regular hybrid. 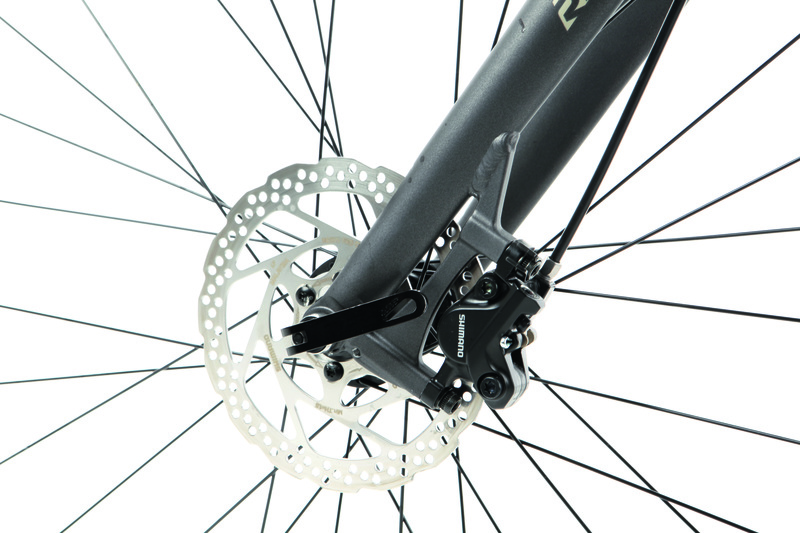 Raleigh has equipped the Strada 6 with excellent Shimano M395 hydraulic disc brakes. Unlike relatively simple cable-operated discs, hydraulic systems can leave home mechanics slightly nervous, but rest assured they’re easy enough to service, and failures are as rare as with cable-operated brakes. In terms of performance they’re a step ahead of almost all other options, particularly for the rider who takes to the road come rain or shine. Unlike rim brakes, their efficiency isn’t hampered by wet conditions. The rest of the Raleigh Strada 6 is also suitably set up for coping with a multitude of tasks. 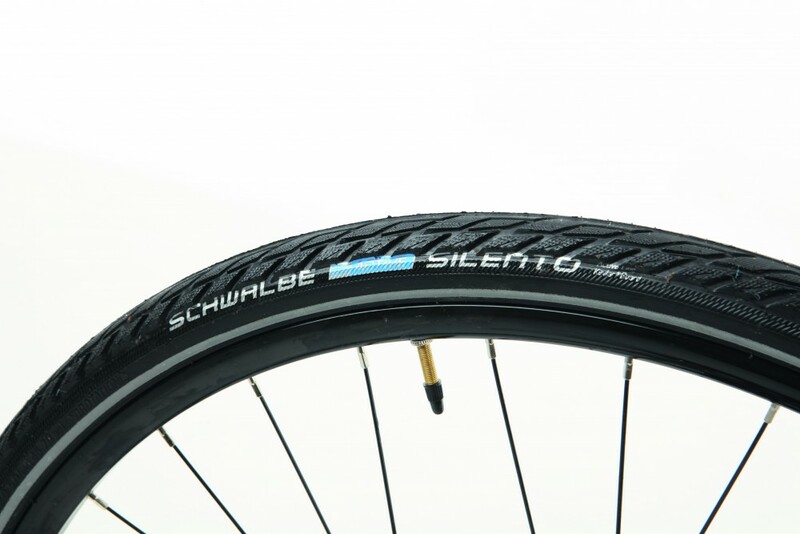 The relatively large volume Schwalbe tyres are grippy on asphalt and also aid comfort. Meanwhile the Shimano Sora groupset is one of the Japanese manufacturer’s best options when it comes to a mixing reliability with competence and budget. It switches between sprockets and rings nicely, and features enough of Shimano’s tried and tested technology to reassure even the most worrisome of rider. But now to that potential as a touring bike. One of the few problems we encountered with the Raleigh Strada 6 occurred when the bike was heavy or when the road ramped upwards. The bike is fitted with a regular two-chainring compact chainset on the front, and a spread of gears up to a 32t sprocket on the back. That leaves the rider a few inches short of the ideal gear on steeper climbs with a fully-loaded bike. To match the Strada 6’s do-anything aura, a triple chainset would do wonders. Another concern is the handlebar area. In terms of contact points, Raleigh has done a decent job, but if you’re planning to use this for more than one or two-hour blasts you may encounter aches and pains around the shoulders and back. A set of quite unfashionable tri-bars would be a great benefit — and never mind the mocking! However, on the upside, during a typical daily commute you’ll appreciate the direct handling and never feel a twinge. In fact, the daily commute along with a vast range of relatively benign cycle challenges is where the Raleigh Strada 6 excels. As a general purpose bike it is hard to fault, combining efficiency, security, and really a rather enjoyable ride experience with a laid-back manner. It’ll also take on weekend pub rides, charity events, and a bit of mixed terrain adventurings. So this bike can do it all, and do it every day without missing a beat. OK, a relatively cheap hybrid can’t compete with an expedition touring bike on an epic multinational voyage. But for casual touring — as well as almost everything else you can think of short of day-long missions — the Raleigh Strada 6 proves you don’t need much more than a hybrid. Compared to some rivals, the Raleigh Strada 6 is what we might call a 'traditional' hybrid. It doesn't specialise in one are, but it'll have a game attempt at most cycling duties.